Have you noticed that seeds are everywhere lately? Pretty much anywhere you can buy food, you can buy seeds with claims of all sorts of healthy benefits. I've eaten most of them, but I was pretty sure I'd never had hemp or chia seeds, so I got both. Together, they make up #41 in my 43 new-to-me challenge. We sprinkled our seeds on plain Greek yogurt and then tried a handful plain. The chia seeds were what I expected - plain and pretty neutral. I gave them a 5. Andi said 9 and Ann said 8. On the other hand, I absolutely HATED the hemp seeds. Hated them. They tasted sour, almost rancid, and just awful. I gave them a 1. Andi said they tasted like almost-rancid almonds, but still gave them a 5. Ann liked them just fine and gave them a 6. I couldn't get either of them to take the extras home though! I'd be totally afraid of hemp seeds... so I would probably rate with you! LOL! 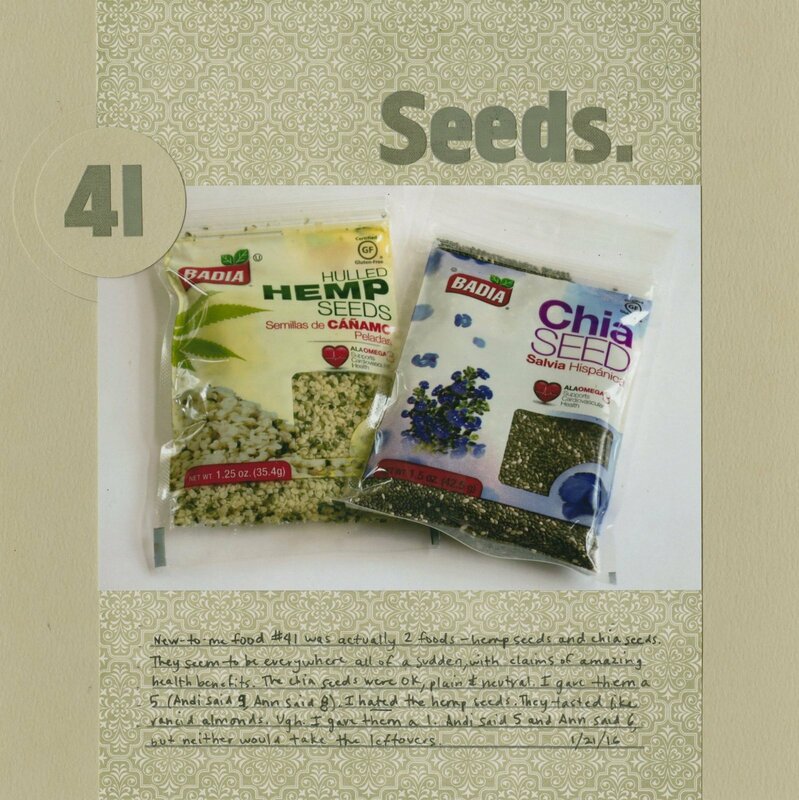 Although I haven't tried hemp seeds yet, I use chia on a regular basis in our smoothies for health benefits. We use chia in our overnight oatmeal recipe. I haven't tried hemp, but it doesn't sound like I'd want to at all. My son eats the chia. I tease him and tell him he's going to grow a plant in his stomach like the "Chia Pets" I've never heard of hemp; sounds like I don't need to! What kind of hemp seeds? I love hemp hearts. They are raw shelled hemp seeds and they have a nice nutty flavor. I have never tried them with the shell. I like chiari especially in coconut cream or milk. Soak them overnight and eat like a pudding for breakfast. The package just says hulled hemp seeds.